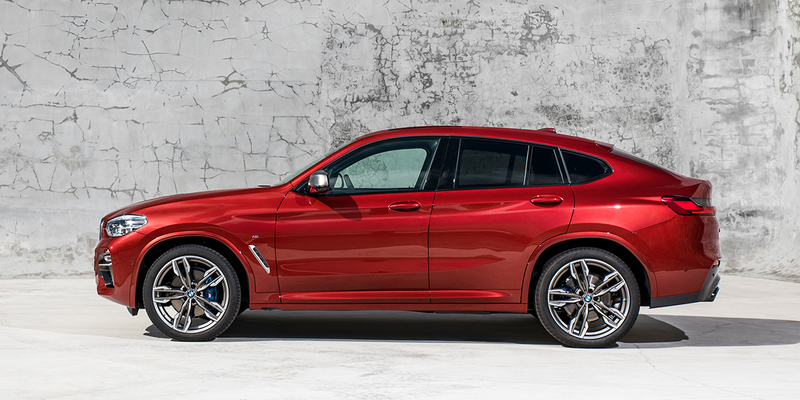 CG Says: The BMW X4 is redesigned for 2019. The X4 is a fastback-roofed version of BMW’s X3 compact SUV, which was redesigned last year; the X4 now joins it on the new, slightly larger platform. The X4’s wheelbase grows 2.2 inches to 112.8, overall length grows three inches, and width increases by 1.4 inches. These changes benefit rear-seat legroom and cargo room. Last year’s base xDrive 28i model becomes the xDrive 30i, and its turbo 2.0-liter 4-cylinder engine gains eight horsepower for a total of 248. The 355-hp turbocharged 3.0-liter 6-cylinder of the high-performance M40i is unchanged. Both engines are paired with an 8-speed automatic and all-wheel drive is standard. In addition to its stronger engine, the M40i gets a sport suspension and special trim inside and out. Available features include forward-collision warning and mitigation, pedestrian detection, adaptive cruise control with stop and go, blind-spot alert, active lane-keep assist, park assist, ventilated front seats, and panoramic sunroof. The X4’s swoopy, sloped-roofline body emphasizes style over the rear headroom and cargo space of the X3’s traditional wagon body. The X4’s slick styling may appeal to some buyers, but we prefer the X3’s superior cargo capacity, rear-seat passenger room, and lower sticker prices.